With its red brick façade, towers and Gothic windows, Clarion Collection Hotel Borgen is Örebro's very own fairy-tale castle. The building was constructed in 1891, in a style inspired by the Middle Ages. The architects were Fritz Ulrich and Eduard Hallquist. Through the years the building has been home to Örebro Sparbank, writer Hjalmar Bergman and the Nerikes Allehanda newspaper, which had its main editorial office in the building from 1934 to 2013. The hotel may be new, but the grounds are steeped in history. Historical grounds. There have been buildings here at Norra Strandgatan since the early 1700s. Industries were attracted by the proximity and access to Svartån's flowing waters that ran mills, power plants, drill housing, dye works and tanneries. In 1730, Anders Elg built Örebro's first dye works on the very spot that Clarion Collection Hotel Borgen proudly stands today. Although this part of Örebro made it through the large city fire of 1845, the dye works came to an end. Instead, the city's main tannery was established, Wallgrenska tannery, which was successfully operated by Olof Wallgren. Following the tannery's heyday until 1889, a new era dawned for this popular site. When the old building was demolished, this address became of great interest to Örebro Sparbank which had outgrown its premises in the Town Hall on the main square. 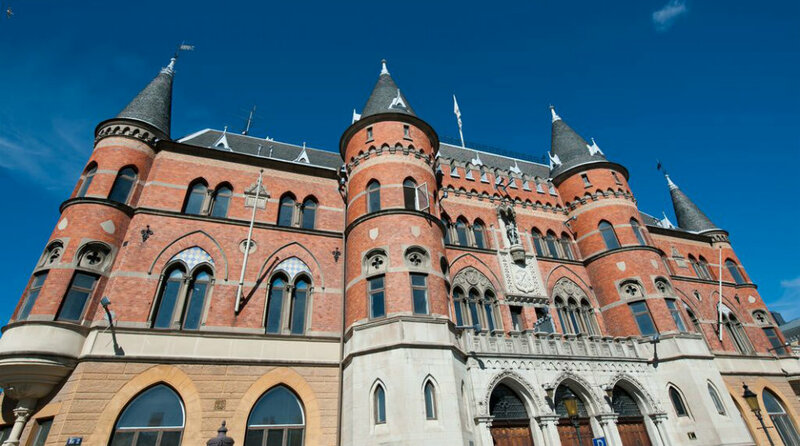 The bank's accountant and director Claes Bergman visited Gothenburg, Lund, Malmö and Ystad to glean inspiration from the various banking buildings. Sparbanken bought the former tannery property and Stockholm architects Fritz Ulrich and Eduard Hallquisth were commissioned to design the new bank building. In addition to banking facilities, the building was also to contain residential apartments and a telegraph office. On 1 September, 1892 the new bank building was finally ready. With its red bricks from Skåne Börringe and roofing slate from nearby Grythyttan, this must have been an impressive and majestic view for the people of Örebro. The Gothic, pointed arched windows made the buildings resemble a northern European medieval castle. As was customary, a box was built into the wall which held information such as the bank's name, the year it was built, the King's name and reign, the names of the bank's founders, directors, officers, architects, builders, as well as the day's newspaper and copper and silver coins. The red brick castle also has its place in Swedish literature. Hjalmar, bank manager Claes Bergman's only son, often sat and watched the city and passers-by from the salon window of the family home on the 2nd floor. Everything he saw and absorbed at that time became the basis for his place in history as one of Sweden's most beloved authors. This was where his literary career began with Solivro, written in his youth, but this was also the inspiration for his most widely read book Markurells i Wadköping, where Wadköping is a fictional city with Örebro as a model. The historical photographs of Borgen are from Örebro's city archive and were taken between 1890 and 1938.